In contrast, European economies have not been performing as well with many barely growing in the second half of calendar 2018 and some even contracting. Growth for the region as a whole was only 0.2% in the September and December quarters, the slowest quarterly growth rate in four years. Germany, Europe’s largest economy, had a flat December quarter, after a negative 0.2% the previous quarter, and hence averted a recession. Not so Italy, where a negative 0.2% growth in the final quarter confirmed the economy was in recession. The U.S. trade sanctions on Chinese imports appear to be having a second-round negative effect on European exports. Nonetheless, the German market was pushed higher (up 6.6%) off the back of the global equity rally. In the UK, the Brexit date came and went and still there is no clear path to exiting the EU and the impasse is now fracturing both major political parties. But here too the market enjoyed a solid performance, rising 11.1% for the quarter. 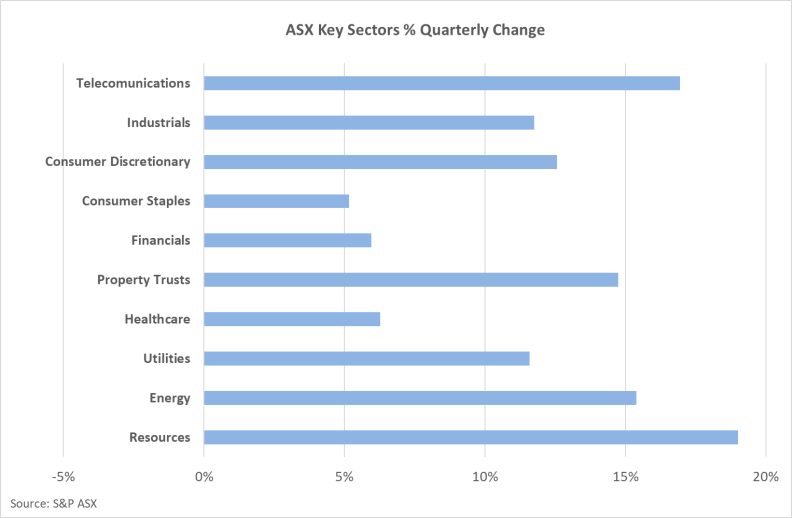 Locally, the ASX recorded its best quarter since September 2009, rising a solid 10.9% despite concerns over the momentum of economic growth and the prospect of a change of Government. This more than made up for the disappointing 8.2% decline recorded in the previous quarter. Iron ore miners were big winners with BHP and Rio Tinto enjoying solid gains. The Banks also had a recovery off the back of the release of the Hayne Royal Commission report. Although the report called for some change in the wealth industry, it stopped short of advocating an end to vertical integration (the practice of advice businesses and fund managers being ultimately owned by the same institution). Interest rate sensitive Property Trusts also enjoyed solid returns. US policy makers implied they would keep interest rates on hold for the year, in contrast with their December forecast for two rate hikes, as slowing global growth weighs on the US economy. Consequently U.S. 10-year Treasury Notes fell below three-month treasury bills for the first time since 2007. In Australia, 10-year bond yields hit a new record low of 1.73% in March to end the month at 1.78%. Half a percentage point of interest rate cuts by the Reserve Bank is now fully priced in by the futures market, which sees the cash rate at 1% by August 2020. 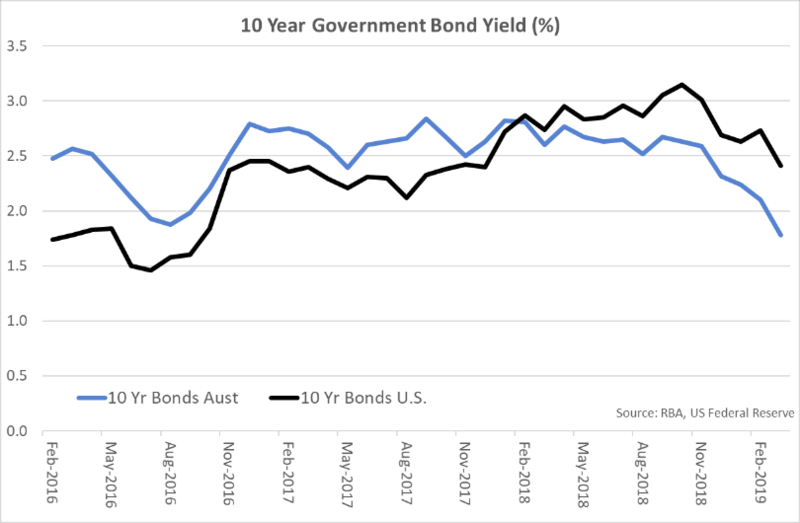 Despite these expectations of lower interest rates in Australia, the $A remained relatively stable over the quarter, finishing at U.S. 70.9 cents after opening the quarter U.S. 70.6 cents. The ongoing rally across global equity markets has once again pushed valuations to the upper ranges of fair value. These higher valuations increase the vulnerability of share markets to a correction in the months ahead. Potentially, financial markets have become too optimistic that the period of rising U.S. interest rates is behind us. Should further inflationary pressure emerge in the U.S., then the central bank may have little option other than to raise interest rates. Such a course of action would be negatively received by both equity markets and bond markets. Domestically, there are fewer concerns around rising interest rates, given the subdued outlook for economic growth and ongoing lack of any inflationary pressure. The weak growth cycle does contain risks for parts of the local equity market, with the housing down turn also justifying ongoing low valuations for the banks. With the growth in resource sector values over recent months, the opportunity presented by strong demand and prices appears fully reflected in valuations. 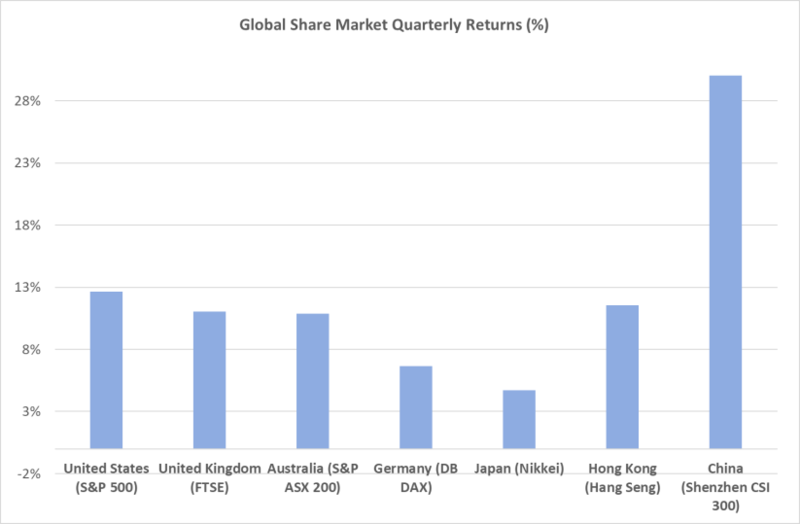 Given the global and domestic concerns outlined above, our portfolio positioning remains relatively cautious with overweight equity and bond positions being avoided. Holdings of cash and Alternative assets are being maintained, providing a potential source of funding should opportunities emerge to purchase equities and bonds at cheaper prices over the course of 2019. The following indexes are used to report asset class performance: ASX S&P 200 Index, MSCI World Index ex Australia net AUD TR (composite of 50% hedged and 50% unhedged), FTSE EPRA/NAREIT Developed REITs Index Net TRI AUD Hedged, Bloomberg AusBond Composite 0 Yr Index, Barclays Global Aggregate ($A Hedged), Bloomberg AusBond Bank Bill Index, S&P ASX 300 A-REIT (Sector) TR Index AUD, S&P Global Infrastructure NR Index (AUD Hedged). This newsletter is provided by Hillross Financial Services Limited (ABN 77 003 323 055 & AFSL No. 232705) an AMP Group Company. It is of a general nature only and any advice is not based on your objectives, financial situation or needs. Accordingly, you should consider the appropriateness of any advice to your personal circumstances before acting on the advice. Before you make any investment decision, you should read the current Product Disclosure Statement available from Hillross or your financial adviser. Although this information was obtained from sources considered to be reliable, we do not guarantee it is accurate or complete. The information in this publication is current as at 7 October 2018 and may change over time. Hillross is part of the AMP group of companies. No additional remuneration or other benefits are paid to us or our related companies or associates in relation to the advice provided on this page. If you decide to purchase or vary a financial product, your financial adviser, Hillross and other companies within the AMP Group or associates of Hillross will receive fees and other benefits, including fees calculated as a percentage of either the premium you pay or the value of your investment. Further details are available from your adviser or Hillross. Past performance is not a reliable indicator of future performance.